Nuestro dosificador cuadrado incorpora una palanca de precisión diseñada para dispensar de forma precisa y sin esfuerzo con una sola mano. Presiona ligeramente para dispensar solo un poco de jabón, presiona hasta el fondo para dispensar más. Su compacto tamaño es perfecto para cualquier baño y, gracias a su amplia apertura, reponerlo es pan comido. Prueba nuestro jabón simplehuman en cómodas bolsas de recarga de 1 litro y disfruta de una forma más sencilla y eficiente de comprar jabón. Diseñada para dispensar jabón de forma precisa y sin esfuerzo con la ayuda de una única mano. Presiona ligeramente para dispensar un poco de jabón y hasta el fondo para dispensar más. Fácil de usar con la ayuda de una única mano. ¡No vuelvas a comprar nunca otro bote de jabón desechable! Nuestro jabón, con su fórmula especial, viene en cómodas bolsas de recambio de 1 litro con autocierre, tan respetuosas con el medio como económicas. Una forma más fácil y eficiente de comprar. Easy to fill and easy to use. Best addition to my kitchen and bathroom sinks. This soap dispenser operates one-handed, which is a more reliable design than the Simple Human designs that rely on sensor technologies. I bought this shallow square one after buying a much more costly larger model that involved no-handed sensor technology that failed. Avoid the models that rely on sensors! Thank you for your feedback. We're glad you're enjoying your Square Push Pump. Feel free to call us at 877-988-7770 8am-5pm PST M-F should you ever need help with any of our products! Great product, sturdy, and attractive. I think I probably won't need to ever buy another dispenser. 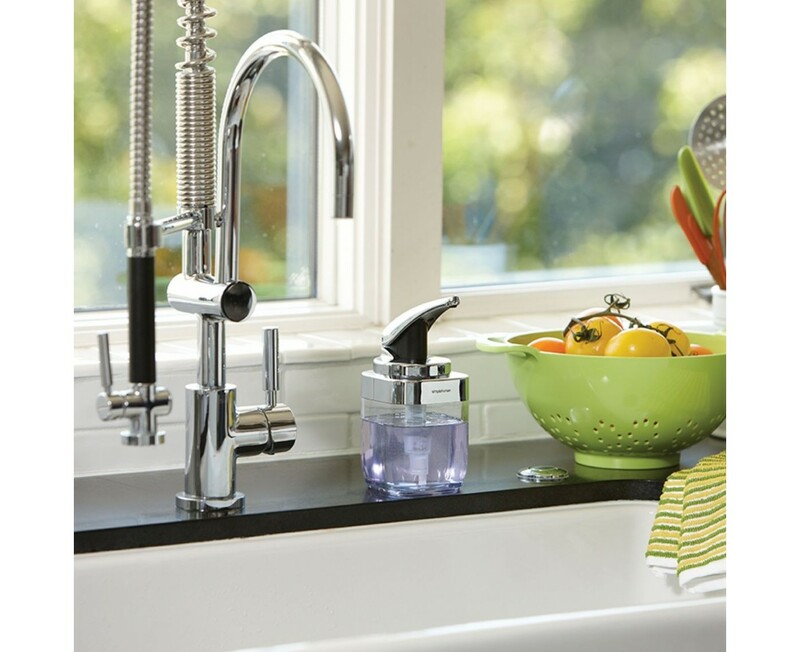 Love this soap dispenser for it's simplicity. Very attractive in my new bathrooms. I love that it is clear, so I can see how much is left. Loved it so much, bought 3 more! Holds heaps. Is neat and stylish. Doesn't take up much space. I love it. I got 3 - ensuite, guest room and pool room. Perfect in all locations. The mighty little soap dispenser! For a lover of good design and good engineering, this sturdy little guy is where it's at! I have one for my kitchen too! Impressive style, easy to use and functional. A gentle pressure on the front end of the arm gives a measured amount of gel and a heavier push suits bigger hands. Great liquid soap and refills easily purchased on line. très bel objet, de qualité. on peut assortir la couleur du savon avec sa salle de bain, le rendu est très réussi. This is the second pump ordered. Like it! Looks as pictured. Hold plenty of liquid. Pump, easy to use. LOOKS GREAT - WORKS GREAT & GREAT PRICE !!!! I love the new design. It is a very nice soap dispenser. This arrived broken and given it is an inexpensive item I aske Simplehman to just send me another one. I sent them a photo. But the got all bogged down in procedures so I gave up. I have bought a lot of things from them over the past few year and they are usually great but they let me down this time. Thank you for your feedback. We're so sorry to hear about your experience. A customer support representative has reached out to you to resolve this matter. I got this as a replacement for an older model, that was going on 5 years old! The pumping mechanism on this one seems smoother. The soap reservoir holds more than previous, and the screw off pump top makes filling it much easier. So far, no drips, no wobbles, nor any problems. When I initially contacted Simple Human about the older pump not working, they took care of it quickly and hassle free. I purchased two of these about a month ago and so far so good. Works like it should - quality is good. Still like the no-touch usb charging ones we have better, but they're too expensive to have everywhere you need a soap dispenser. I've had no issues with leakage or breaking. They're easy to fill and they have a nice clean look that goes with any style. This pump replaced an older, stopped functioning model. Works great, looks more modern BUT Simplehumans' response to replace, hassle free is why I support all their product line. I really like both the look and the functionality of this pump. And I congratulate Simple Human on following through on its guarantee. The first one I bought leaked, and they replaced it with no problems. My new one is terrific. The quality of this product for me has not been good. The pump has broken 4 times, but Simple Human has been good about replacing it and paying for shipping both ways. I'm disappointed in this product, I would not recommend it, and hope they get the problem fixed on the next batch. We appreciate your feedback and have forwarded this to our product development team. We apologize for any inconveniences. Have three of these pumps and they are great. This is perfect! I bought the bigger one with the holder attached and it was too big for my counter, so I returned it and got this one. I love the ease of it. I had been looking for something like this for a while now. I don't like automatic-wastes too much soap. This one can be pushed down a little or a lot to dispense what you need. And it holds a lot of soap! I've had it for a month now and it looks like it will last, well made. Used for washing up liquid and dispensing hand soap. 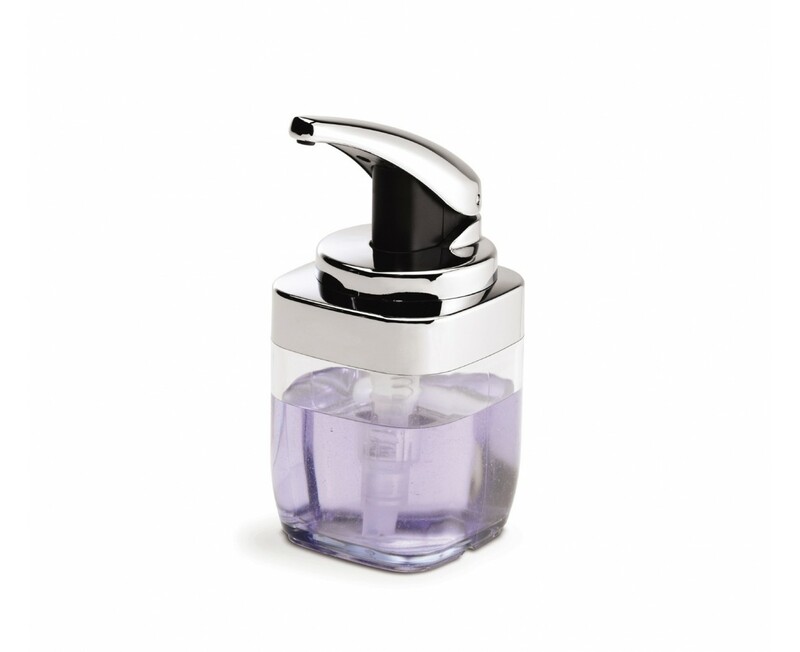 Clean lines, very good capacity, easy to keep clean, looks very good on display, long neck makes dispensing convenient and soap comes out reliably with minimal drippage issues. Looks good, holds enough soap works very well and seems to be well made. NO BATTERIES! My fav about this product. I bought the larger one at BB&B for my kitchen and had to have more for my bathrooms. Couldn't find one without the lucite holder for kitchen so went to SimpleHuman.com. So happy to find these smaller ones at SimpleHuman.com These are a perfect size for my bathrooms. Recent complete bathroom revamp, this product sits nicely filled with hand cream, and is used by family and friends. This dispenser does not drip, it is very appealing, and extrembly well made. It is used frequently and is very durable.